Hidden deep within the Mutou Valley of the Flaming Mountains, the Bezeklik Thousand Buddha Caves mark the beginnings of Buddhism in China. Though they have suffered great damage over the years, the name “Bezeklik”, which in the Uyghur language means “a place with paintings” or “a beautifully decorated place”, gives us some idea of their former glory. The Buddhist grottos within the complex were constructed from the Southern and Northern Dynasties Period (420-589) right through to the Yuan Dynasty (1271-1368), meaning the scope of art styles is incredibly diverse. Although it is essentially a religious place, many of the paintings depict images of aristocrats who made donations to support the site’s development. After all, even in ancient times people still wanted to get their moneys worth! They are located about 45 kilometres (28 mi) east of Turpan and approximately 15 kilometres (9 mi) north of the Gaochang Ruins. 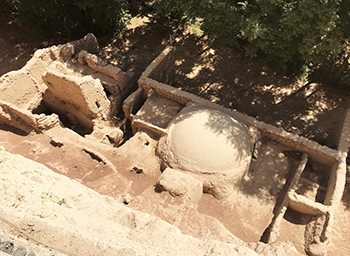 Since the ancient city of Gaochang was one of the major trading hubs along the Silk Road, it would have also been one of the first places where Buddhism arrived in China and thus it witnessed the earliest development of Buddhist cave art in the country. Many of the grottos within the Bezeklik Caves were commissioned by members of the Gaochang Kingdom, who ruled over the area during the 6th century, but the vast majority of the surviving grottos date back to between the 10th and 13th centuries, when the area was ruled by the Uyghurs. Thus the art within the caves is not only a mixture of styles, but also features people of multiple ethnicities. 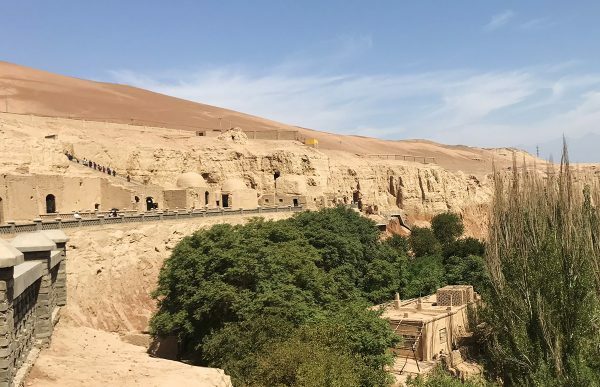 When Islam swept through Central Asia during the 15th and 16th centuries, much of Xinjiang’s population converted and the Bezeklik Caves were completely abandoned. During the ensuing religious clashes, many of the murals within the caves were destroyed. Since Muslims believe that images of sentient beings are blasphemous, the figures in several of the paintings have noticeably had their eyes scratched out or their faces obscured. This means some of the scenes within the caves now resemble a set from a horror movie! Further damage was caused when local farmers broke off parts of the earthen walls and the murals to use as fertiliser. So remember, if you happen to sample any of the locally grown vegetables in the area, they might be sacred! Towards the beginning of the 20th century, foreign explorers rediscovered the caves but unfortunately stole many of the murals and sent them to their home countries. In particular, some of the most beautiful and best preserved murals were forcibly removed by explorer Albert von Le Coq and sent to Germany, where they were permanently fixed to the walls of the Museum of Ethnology in Berlin. This meant that, during the Second World War, they could not be removed and were subsequently destroyed when Berlin was bombed by the Allies. Though this loss was undoubtedly tragic, nowadays many of the remaining murals are safely kept in museums around the world, including the Hermitage Museum in St. Petersburg, Tokyo National Museum in Japan, and the British Museum in London. Today the site is separated into 77 numbered grottos, of which only 40 still contain their original murals. What makes these murals so unique is that they feature images of people from multiple ethnicities living, working, and socialising together. Chinese, Indians, Turks, Mongolians, Uyghurs, and even Europeans grace the walls of these magnificent caves, providing evidence that Gaochang was once one of the first multi-ethnic cities in the world. The inscriptions that accompany the paintings are written not only in Chinese, but also in the ancient Uyghur language and several other languages, which has given historians an invaluable insight into the interactions between these peoples. The murals within Caves Number 16 and 17 are often regarded as the most exceptional. In Cave No. 16, there is a painting of a musician playing an ancient instrument known as a xiao hulei. This instrument greatly resembled a lute and originated from Yunnan province in south China, which implies that northern and southern China had far more contact during the Tang Dynasty (618-907) than was previously believed. The mural in Cave No. 17 is widely considered to be a depiction of the Manichaen version of Hell. Manichaeism was a major ancient religion that originated from Iran and was once the main rival of Christianity. Although the religion is now extinct, the artwork in this cave suggests that it was once popular in the Turpan region between the 9th and 12th centuries. Aside from the murals, another highlight of the area is its characteristically alien landscape. The huge sand-dunes, rust-coloured mountains, and deep canyons all give the caves’ surroundings an undeniably exotic flair.